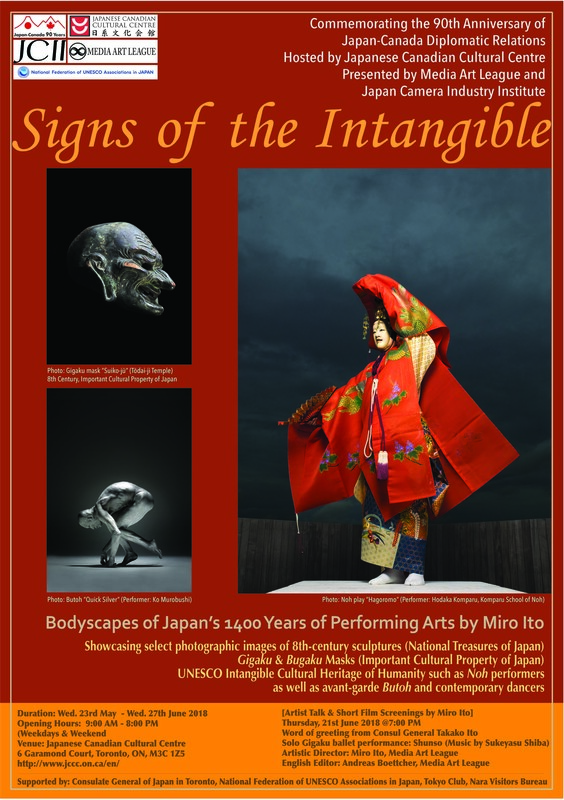 Commemorating the 90th Anniversary of Diplomatic Relations between Canada and Japan, our new exhibition“Signs of the Intangible” can be experienced at the Japanese Canadian Centre in Toronto. Co-organized by Media Art League and Japan Camera Industry Institute, this presentation showcases the 1400 years of continuity in Japan’s performing arts in exquisite photographs as well as short film format. 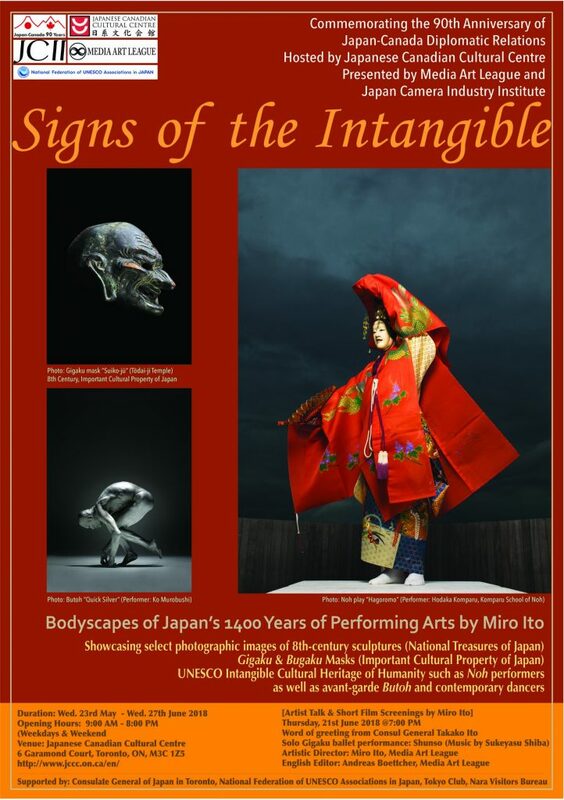 It features 55 outstanding photographic images of select National Treasures of Japan, as well as UNESCO Intangible Cultural Heritage such as Noh performers, or avant-garde Butoh dancers as well as contemporary dancers. Topical film shorts by Miro Ito will also be shown. 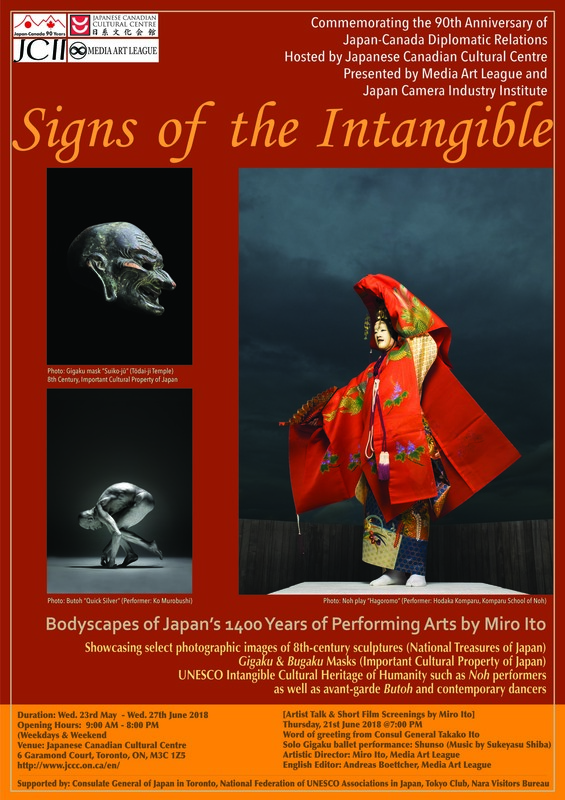 The uniqueness of this presentation accentuates a “never-seen-before” perspective on how these exceptional tangible or intangible arts and traditions interact: 8th century Buddhist sculptures influenced by Hellenistic culture, Gigaku and Bugaku masks (that came to Japan in the 7th century via the Silk Road), Noh performance and Kobudo martial arts with their 600 year tradition, as well as contemporary dance performances like Butoh. Nurtured in a nature worshipping environment (Shintoism) where everything is seen as a manifestation of kami, and influenced by Buddhism, the key element that provides continuity is the dedicatory tradition evident in the Shinto-Buddhist syncretism prevalent in Japan since the 7th century. From the 12th century onward, Zen Buddhist influences, advanced an ideal of mind-body unity called “shinshin ichinyo“, as the path to emancipation/liberation (gedatsu) — not only in religious contexts, but also —- in performing arts like Noh and in martial arts, such as Kobudo, under the patronage of the samurai clans that inherited the shogunate. As Zen Buddhist teacher, Hakuin put it “our soul has a physical dimension and our body has a spiritual dimension”, so the body is the “ba” (topos) for the transformation towards an ultimate goal of “gedatsu” (lvimokṣa in Sanskrit) in Oriental ascetic tradition and meditation. 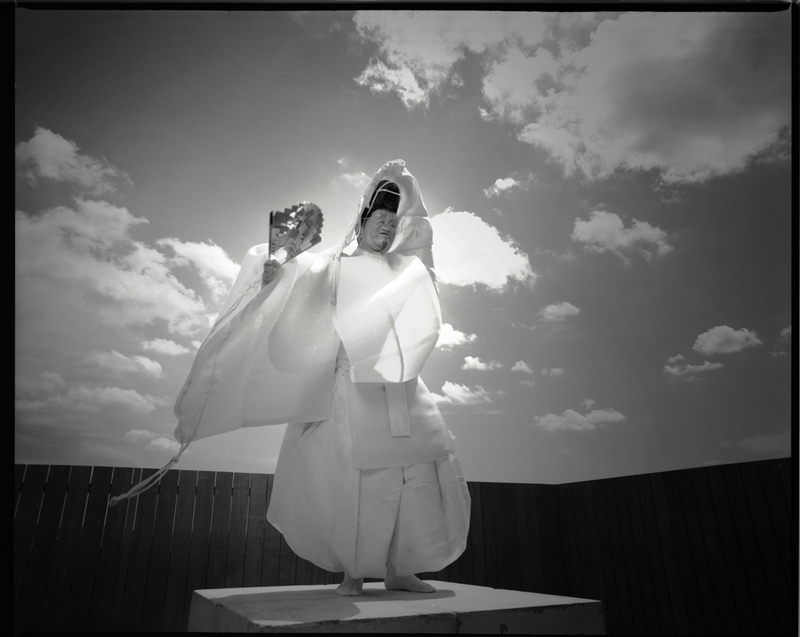 This project’s unique perspective pursues the foundations of the profundity of Japanese culture as well as the origins of various types of Japanese performing arts as an enduring legacy of ancient cultures from the Eurasian continent. Evidently, the origins of many Asian sculpting traditions can be traced back to statues (Άγαλ&α) dedicated to ancient Greek deities. This presentation, “Signs of the Intangible” showcases select artwork as “evidence of the interconnectedness of East and West”. This is the very essence of the messages enciphered in the history of 1400 years of Japanese Performing Arts. Support by: The Consulate-General of Japan in Toronto, the National Federation of UNESCO Associations in JAPAN, the Tokyo Club, Nara Visitors Bureau, etc. Text by Media Art League. Photographs: Miro Ito. All Rights Reserved. This entry was posted by mediaart in World heritage of life and prayer and tagged #Bugaku masks of Kasuga-taisha shrine, #Gigaku masks of Todai-ji Temple, #Japanese Canadian Cultural Centre, #National Treasure of Japan in Nara, #Photographs of Butoh, #Photographs of Ko Murobushi, #Photographs of Noh performers, #Photographs of Sal Vanilla, #Photographs of Shunso, #Sings of the Intangible, #Tenpyo Sculpture, #Todai-ji, #Toronto, masterpieces of tenpyo era sculptures, Media Art League, Miro Ito, National Treasures of Japan.